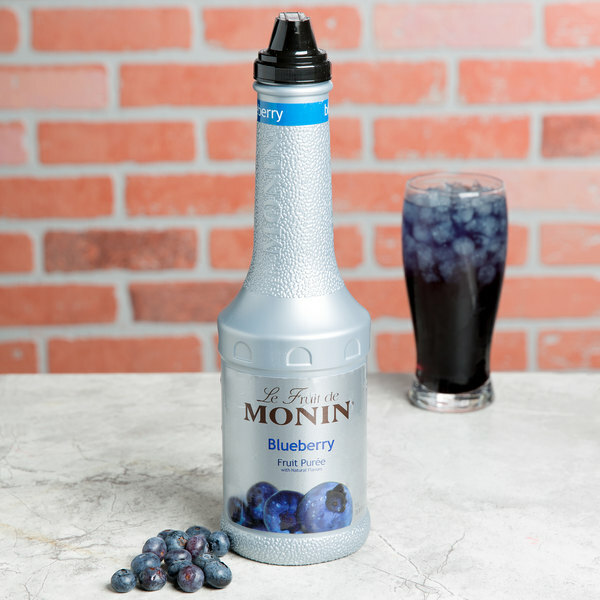 Take your cocktails and smoothies to the next level with this Monin 1 liter blueberry fruit puree! 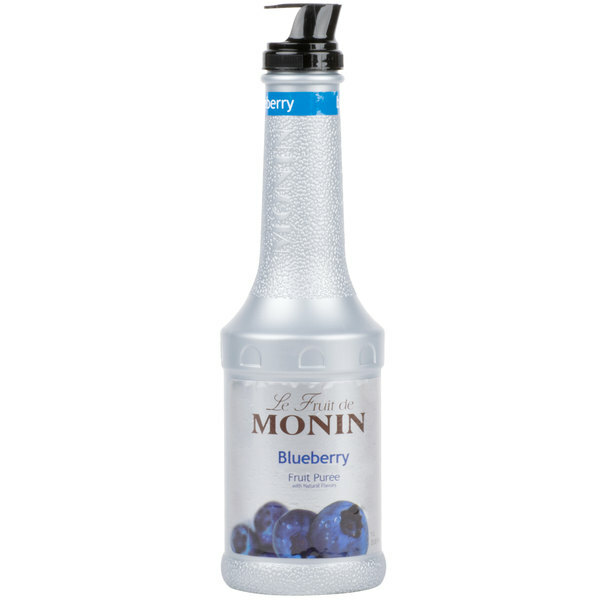 This Monin blueberry fruit puree is a quick and easy way to enhance beverages without adding too much sweetness. Made with high quality, real fruit and natural flavors, it contains no artificial colors, flavors, preservatives, or sweeteners. Shelf stable and requiring no muddling before use, this concentrated puree promises to deliver consistent, delicious flavor to your food and beverages! "The blueberry puree is delicious and makes a really nice blueberry pomegranate spritzer. A great tasting puree that taste like real fruit instead of sugar. I love it." This premium puree features a bold and juicy blueberry taste with a tart sweetness that is perfect for a wide variety of drinks and desserts. Use it for creating refreshing smoothies, iced teas, lemonades, mules, and juleps, or even to create parfaits and ultra-moist muffins in your cafe! Packaged in a durable, plastic bottle, this puree is an excellent addition to any bar, restaurant, or cafe. It boasts a sleek appearance for an attractive shelf presence and has a pour-style cap so the puree can easily be added to drinks. It can also be paired with a compatible pump for quick, efficient service during peak serving hours. Since 1912, Monin has had a passion for delivering premium products that simplify the beverage-making process. A third generation family-owned company, Monin's uncompromising integrity to high quality ingredients has made it a proud leader in the industry today. Focusing on using premium ingredients and versatility in application when creating its products, Monin is constantly innovating and expanding its product portfolio with products that deliver new and exciting flavors, with equally enticing aromas, to the market. 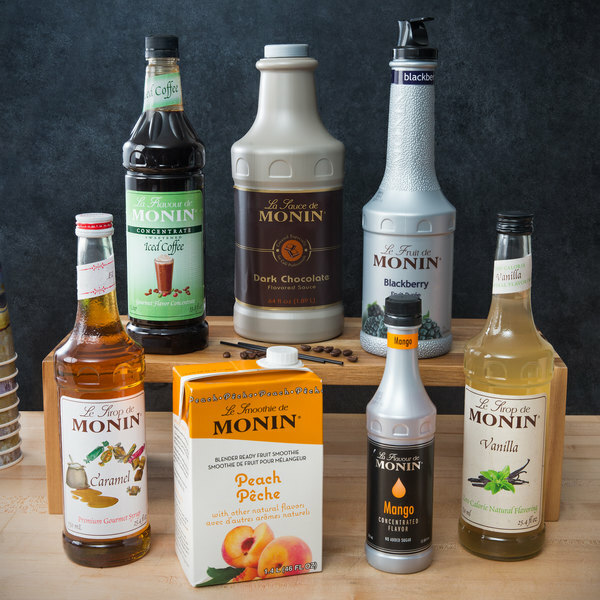 Offering everything from flavoring syrups, sauces, and concentrates to real fruit purees and complete smoothie mixes, deliver a statement of quality to your beverages when preparing with Monin's gourmet flavoring products. What is the difference between a smoothie mix and a fruit puree blend? Smoothie mixes and fruit puree mixes/blends contain different ingredients and are prepared in slightly different ways. Our smoothie mixes include fruit purees and other ingredients that make them ready to use right out of the container for quick preparation. Simply blend the smoothie mix with ice and it can be served as is. On the other hand, it is not recommended to simply blend a puree mix with ice and serve. Our fruit puree mixes are ideal for blending with your choice of additional ingredients to create milkshakes, smoothies, cocktails, and other blended drinks. Can I mix this item with hot dairy ingredients? This item may be used with cold milk, creamer, or half and half. However, it is not recommended for use with hot dairy products. 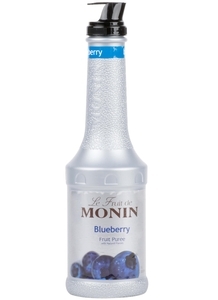 We love the Monin Fruit Purees! We use them for all our sweet & unsweet teas and the guest love them! I highly recommend this! The blueberry fruit puree is great and makes for the best blueberry margarita and slushies. The color is awesome and it smells amazing when you open it. A great style bottle as well. 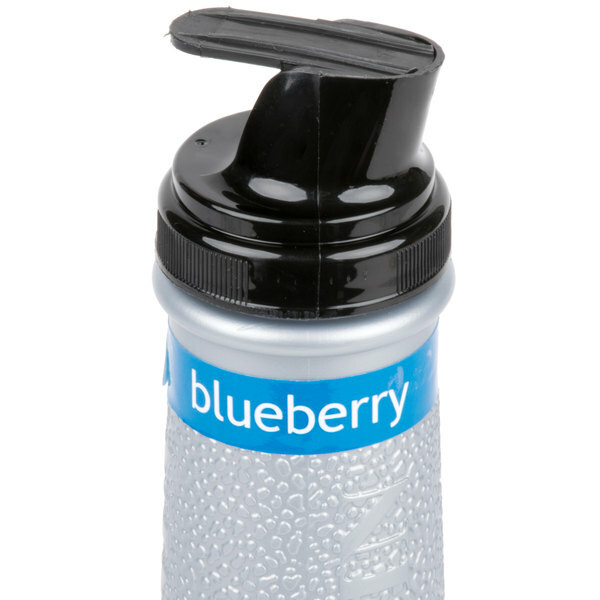 The blueberry puree is delicious and makes a really nice blueberry pomegranate spritzer. A great tasting puree that taste like real fruit instead of sugar. I love it. This is really good! Mix it with lavender syrup and lemonade for a shaken blueberry lavender lemonade...perfect for summer! It would be good as a smoothie addition or even added to vanilla bean frappe mix for a no-caffeine blueberry creme. Great new Monin flavor! We were sad when they discontinued the Superfruit flavor last year and this has been a good replacement. Very popular in a smoothie on its own, or we use it to jazz up our lemonade. Great price as usual!